The second League of Legends World Championship game between European team Fnatic and Chinese challenger EDG was put on hold today due to an issue with one of the player’s “Q” keys. After determining it was a “game altering bug,” Riot decided to start from scratch. The Q key issue first began to show itself 20 minutes into Fnatic and EDG’s second match of the day. The game was just about to heat up after an extended farming phase during which EDG managed to get a single kill off Fnatic. Then Fnatic player Reignover, who was playing as the big fat barrel-chucking League champion Gragas, started having trouble with his “Q” ability. That’s the one that lets Gragas throw his barrels; it’s a central part of his character’s gameplay kit and identity. The game was put on hold while technical support flooded around Reignover’s desk and tried to troubleshoot the problem and determine if it was a hardware problem (i.e. one with his keyboard) or a software problem (one with the game). After a few minutes, Riot switched its broadcast and back to the analyst desk that’s normally only shown pre and post-game. 20 minutes later, Riot determined it was an “extremely rare” bug that affects Gragas and messes up his barrel-throwing abilities. It switches back to the analyst desk just before the seven-minute mark in that clip. They’re still on the analyst desk as of this writing (about 30 minutes later at this point), but the game is supposed to restart soon. 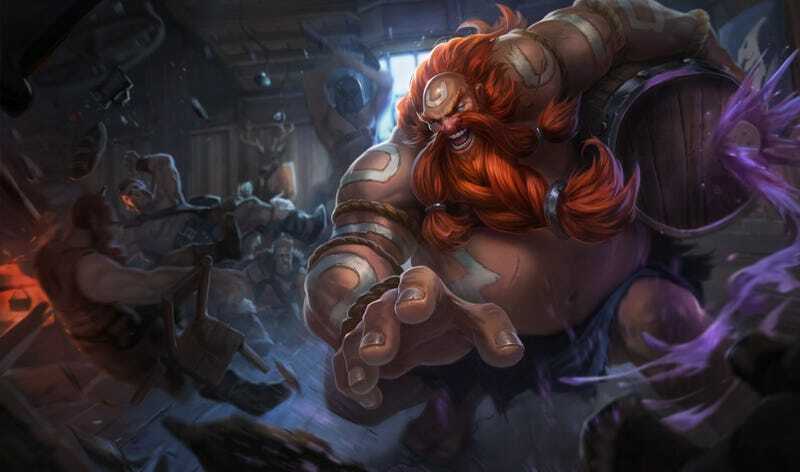 Riot’s analysts said that the Gragas bug, while “game-altering,” was determined to be rare enough that they are going to keep him enabled in the World Championships going forward. I’m betting that Fnatic won’t want to choose him again, though! It’s a huge bummer that this, of all games, was the one to be taken out of commission by a friggin’ bug. It was the first (and probably one) game in Worlds where Morderkaiser and Gangplank, both of League’s most OP/broken champions at present, were being played—against each other, no less! That would’ve been a real Highlander-style showdown. Ah well. At least this is the kind of thing you really don’t get when watching analog sports. aSports? The shoutcasters confirmed that the game was put on hold due to a problem with Gragas’ Q spell, and said that Fnatic was offered a remake, which they of course accepted. They also said that while Gragas’ Q bug is a known issue with the 5.18 patch in which the 2015 Worlds games are being played, Riot will keep him enabled for now “due to the popularity of the champion in the current patch.” If the bug affects another game, however, they said that he will be disabled for the rest of the tournament. Fnatic’s reignover ended up selecting Gragas for the remake, which is really starting to heat up right now. Watch it here. After further investigations following the Gragas bug and remake during Game 2 of the Fnatic vs. EDG series, we have more information about how the bug works and the likelihood of it reoccurring. We know that champion disables are disruptive to team strategies and didn’t want to rush a disable when the exact cause and the likelihood of the bug occurring were unknown. If you have any tips or suggestions for 2015 Worlds coverage, please don’t hesitate to contact me by email at yannick.lejacq@kotaku.com. You can also find me on Twitter at @YannickLeJacq.